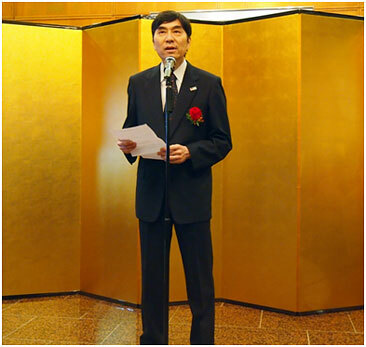 On March 28, Embassy of Japan and Japan National Tourism Organization (JNTO) jointly hosted Japan Tourism Award Presenting Reception at the residence of the Ambassador of Japan. The number of foreign visitors to Japan in 2013 has reached 10.36 million, surpassing for the first time the threshold of 10 million. The number of Singaporean visitors to Japan in 2013 has also reached a record high of 189,280. The reception was held to celebrate these achievements and to recognize those who have made significant contribution to this end. Approximately 80 guests including Mr. William Tan, President for National Association of Travel Agents Singapore (NATAS), travel agencies, airlines as well as other related parties, attended the reception. Ambassador Takeuchi, in his welcome remarks, expressed his appreciation for each and every one who worked hard to realize these achievements. In January 2014, Prime Minister Abe has set the new target of 20 million foreign visitors per year by 2020 when Tokyo will host the Olympic games and Paralympics.Ambassador Takeuchi observed that Japan always has a lot to offer; distinct four seasons, regional diversity from Hokkaido to Okinawa, Washoku (Japanese cuisine), Onsen (hot springs), Omotenashi (hospitality), to cite a few. He asked those who were present to join their efforts to fulfil this goal. Mr. Manabe, Director of JNTO Singapore Office, echoed the Ambassador by expressing his appreciation for the continuous support by all those who have joined the reception and announced ten recipients of Japan Tourism Award who have supported the Japanese travel industry over the years, and in particular, in the aftermath of the Great East Japan Earthquake. Hong Thai Travel Services (S) Pte. Ltd.
Nam Ho Travel Service (Singapore) Pte. Ltd.
Mr. Manabe announced that JNTO President Award be presented to five organizations throughout the worldwhich made special contribution to achieve the goal of 10 million foreign visitors to Japan. 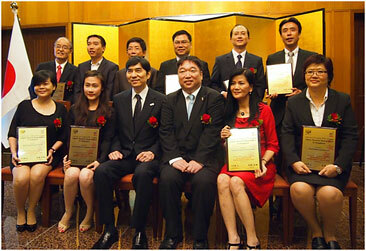 From Singapore, Singapore Airlines was selected as the award winner. 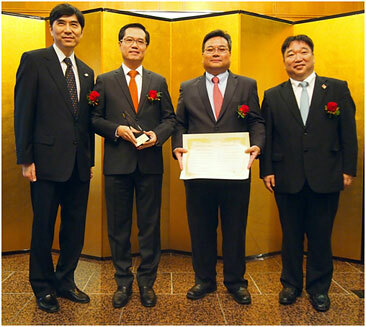 On behalf of the President of JNTO, Mr. Ryoichi Matsumura, Ambassador Takeuchi presented the Award to Mr. Phillip Goh, Regional Vice President of Singapore Airlines.